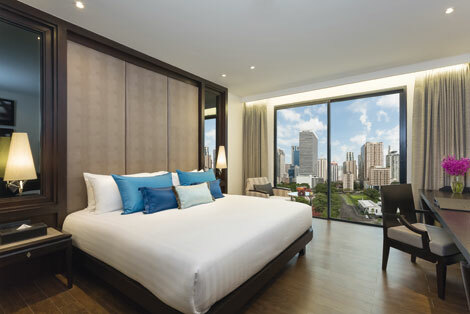 Swiss hospitality group Mövenpick Hotels and Resorts has opened Mövenpick Hotel Sukhumvit 15 in Bangkok. The hotel is located on Sukhumvit Road, next to the BTS Asoke Skytrain and MRT Sukhumvit subway. It is also close to Exchange Tower and the Thanapoom Tower Building, and other attractions such as Terminal 21 Shopping Mall and the Grand Palace. The 297 room and suite property provides amenities including free wifi and a 24-hour tuk-tuk shuttle service. It also offers 300 sqm of meeting space including the 180 sqm Lotus Ballroom. Other features include a two-storey waterfall in the courtyard, a 20-metre rooftop pool and a bar offering superb views of the Bangkok skyline. The Lelawadee Restaurant offers a variety of cuisines from the Thai classics to European and international dishes.